So yesterday was a roller-coaster of big disappoint and big excitement and happiness. Like everything with me and pregnancies, things did not go as planned, or like they do on TV. 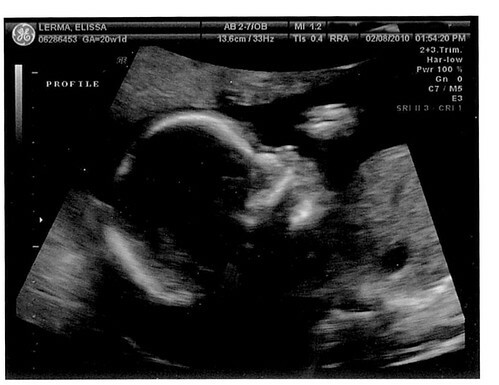 Yesterday was the big ultrasound day. PR Dad had the day off and we were taking The Phi out of school for the big event. I was so excited I could not sleep the night before. 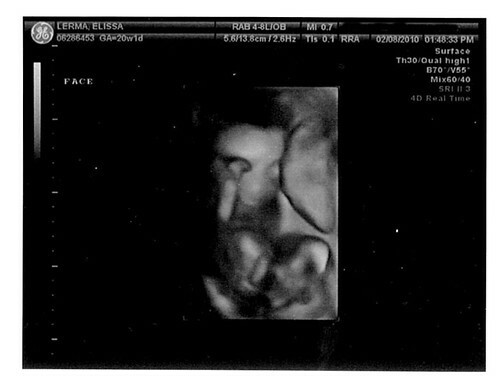 I kept hearing voices in my head saying "it's a boy" and "It's a girl". After a half day at work I headed home to get PR Dad and then we headed to The Phi's school to pick her up. We were all so excited for the big show. Then we walked into the hospital and BOOM The Phi was denied access to the 3rd floor. Why? Because of the H1N1 virus. No one under 18 years old was allowed on the 3rd floor. Now if we were going to the 4th floor she would have been good to go, but the 3rd floor was banned to The Phi and all little humans. I tried pleading with the security guy but he wasn't budging. And since the lady at the gift shop refused to watch The Phi for us (just kidding!) PR Dad had to stay in the lobby with The Phi. So I got all emotional and told The Phi I would be back. She was cool with it. She had her Leapster so she was good. I kissed PR Dad and went up to the 3rd floor for the big ultrasound, alone. As I waited in the waiting room I was that typical emotional pregnant woman in tears because I was so disappointed. Luckily I did not have to wait long and was called in right away. My ultrasound tech was named Rhonda and like everyone at my medical center she was amazing and so nice. She assured me she would take a lot of pictures that I could take back to PR Dad and The Phi. She was quick and she measured everything from the Sweet B's eyeballs to kidney to bladder and everything in between. The exam took a a good 45 minutes and during that time I got a chance to take a good look at Sweet B.
I was surprised to find out that they even did a few pictures in 4-D. Very very strange and cool. Chillin' with hand up to face. And then it was the moment of truth. It was the end of the exam and there was only one thing to check. Gender. 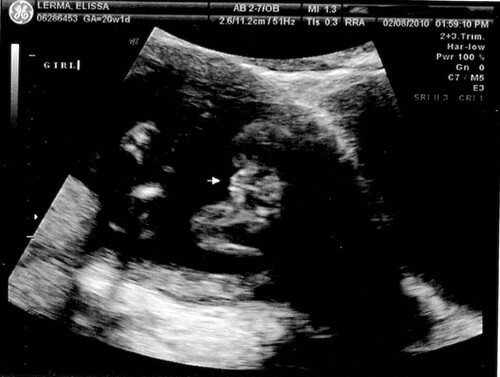 Now when we were pregnant with The Phi she was very modest and shy and always kept her privates private and we were never sure if we were having a boy or girl. This time I was almost certain Sweet B would be the same way and gender would remain a mystery. As soon as she told me I got teary eyed again. Another baby girl. I was so happy and excited and truth be told a little relieved. We knew how to handle a baby girl. 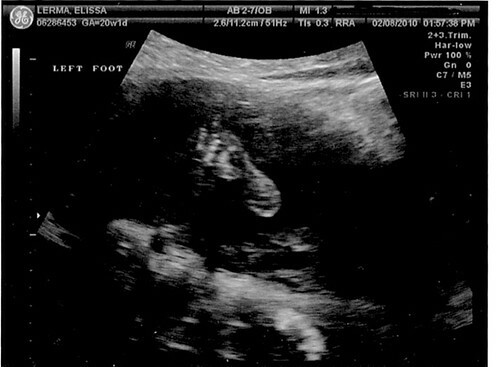 A doctor reviewed the ultrasound and measurements right then and there and told me that everything looked great. Another big relief. I headed back down to the lobby where PR Dad and The Phi were anxiously awaiting some news. I showed The Phi the photos and told her she was getting a little sister. She said she was happy because that is what she wanted. PR Dad said he had a feeling it was a girl. We are so happy and very excited to bring a new girl into the PR Family! Yippee, girls are cool. I've never seen such great ultasounds. The 4D one is amazing.